UPDATE: The Honourable Minister of Justice Jody Wilson-Raybould introduced a government bill to protect gender identity in Canada's Parliament on May 17, 2016. Click here to see TESA's media release regarding this event. As of May 17, 2016, Bill C-16, an Act to amend the Canadian Human Rights Act and the Criminal Code has had first reading in the Parliament of Canada. The following campaign information has been updated to reflect this change. Contact your Member of Parliament and members of the Canadian Senate to include the terms "gender identity or expression" in the Canadian Human Rights Act and the Criminal Code. The phrases "gender identity" and "gender expression," or the phrase "gender identity or expression" are not enumerated (included) in the Canadian Human Rights Act or the Criminal Code. Even without these phrases included in these existing laws, trans Canadians already have full equal rights across Canada under the Charter of Rights and Freedoms, which guarantees rights to "everyone" and "every individual" without exception. Yet having equal rights is not the same as having those rights respected. Adding the terms "gender identity" and "gender expression" or "gender identity or expression" to the Canadian Human Rights Act and the Criminal Code would help clarify these rights to all. The federal government has different rights and responsibilities than the provinces and territories. Federal responsibilities include airports and some penal institutions, while provincial responsibilities include education and governing vital statistics. In Canada, all provinces and territories already protect trans rights either explicitly or non-explicitly. In 2015, the province of Alberta amended two human rights statutes (laws) to list both "gender identity" and "gender expression" explicitly. For trans individuals seeking an education or a new birth certificate, explicit provincial legislation such as Alberta's newly clarified human rights laws is helpful. As Bill C-204 is a private member's bill, government bill C-16 will take precedence regarding readings and votes. In advance of Bill C-279's death, members of the ﻿Senate of Canada﻿ voted to trash the equality rights of trans Canadians. On February 25, 2015, the majority members of Canada's senate standing committee on Legal and Constitutional Affairs voted to amend Bill C-279 so that trans people would be explicitly excluded from accessing some federal facilities. If this amendment had been passed into law, existing trans equality rights would have been trashed. With the introduction of Bill C-16, an Act to amend the Canadian Human Rights Act and the Criminal Code, trans Canadians need to reach out to their Members of Parliament and Senators to ensure broad, non-partisan support for clarifying Canadian equality rights as including "gender identity" and "gender expression" without exception. Let our elected and appointed representatives know that we expect to keep our trans rights, NOT have trash rights! Let your Member of Parliament know that you expect them to work on your behalf to ensure that all Canadians can enjoy our existing equality rights to the fullest. Remember: lettermail to your Member of Parliament or Senator is FREE (no stamp required). Please see below for a sample letter you may use to write to your Member of Parliament or your Senator. To learn more about trans equality rights in Canada, or to change or customise your letter, you may find some of the resources linked below helpful. Feel free to use the sample letter below to contact your Member of Parliament and Senators. Remember to include your contact name and information. NOTE: lettermail to your MP or Senators is free (no stamp required). As a citizen of Canada, a nation committed to equal rights for all citizens, I call on you to support the clarification of equality rights for trans Canadians in the Canadian Human Rights Act and the Criminal Code. While trans Canadians have the same rights as all other Canadians, many trans people are unable to enjoy these rights to the fullest thanks to other people not understanding or not respecting these equality rights. Adding "gender identity or expression" to these laws would also help authorities to consider these characteristics with regards to hate crimes under the Criminal Code, a welcome addition given the rampant violence against trans and gender non-conforming people both in Canada and worldwide. Sadly, repeated attempts for trans Canadians to be accorded this respect in Canadian law have failed. The current government bill before Parliament, Bill C-16, is the latest bill seeking to ensure all Canadians can enjoy shared equality rights. Prior to the introduction of Bill C-16 in Parliament on Mary 17, 2016, one private member's bill (Bill C-279) suffered the addition of an amendment that would have enshrined explicit inequality and exclusion from some federal facilities. The fact that some Canadian senators felt it appropriate to attempt to replace existing equality rights with explicit inequality and exclusion is disgraceful. The government of Canada already has a long, sad history of exclusionary acts, including the internment of Canadians of Ukrainian and Japanese descent, the tragedy of residential schools, as well as other acts that reflect a lack of respect and support for equal rights for all. But such acts should remain firmly in our history. We need to reconcile our disgraceful legacy of exclusion with our reputation as a leader in human rights. 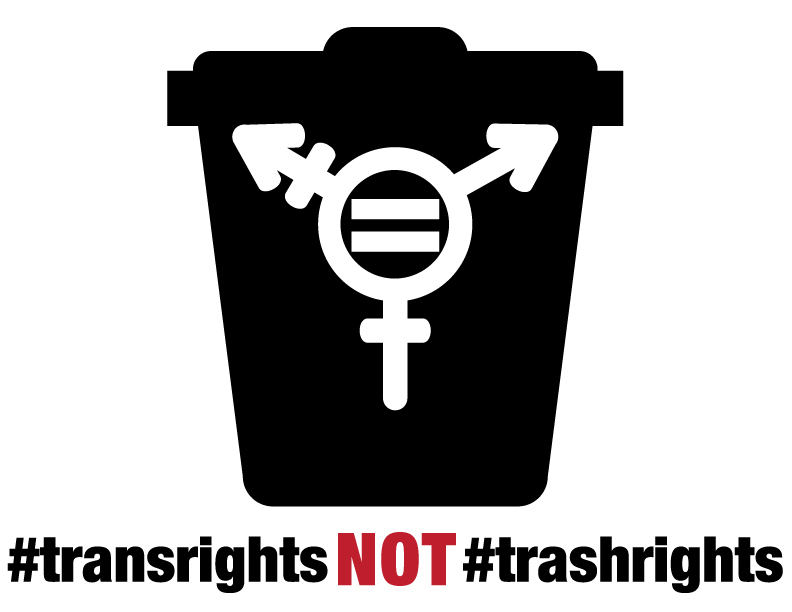 Now more than ever, trans Canadians need trans rights, not trash rights. We need our Parliament and Senate to recognise that all citizens deserve the opportunity to enjoy their equality rights. We need our leaders to choose to stand for all. We need legislation tabled that will ensure "gender identity or expression" are explicitly enumerated in the Canadian Human Rights Act and the Criminal Code. I look forward to discussing the equality rights of all Canadians with you at your earliest opportunity.